After returning to England, De Lalo’s Regiment gained a new Colonel, Viscount Mordaunt. Mordaunt’s Regiment set sail for Lisbon, then to Alicante, under the command of Lieutenant-Colonel Dalzell. The Allied army of Portuguese, British, German, Dutch and French Huguenot troops under the command of the Earl of Galway marched to resounding defeat at the hands of the Franco-Spanish army under the command of the Duke of Berwick. Galway’s army was about 15,000 men strong, Berwick’s, 25,000. 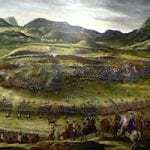 Mordaunt’s Regiment lost around 300 men of the 532 who stood in its ranks at the outset of the battle. Have died for England’s glory. Logan [A Pedlar’s Pack of Ballads and Songs, 1869], p. 82, from a broadside of about 1760.